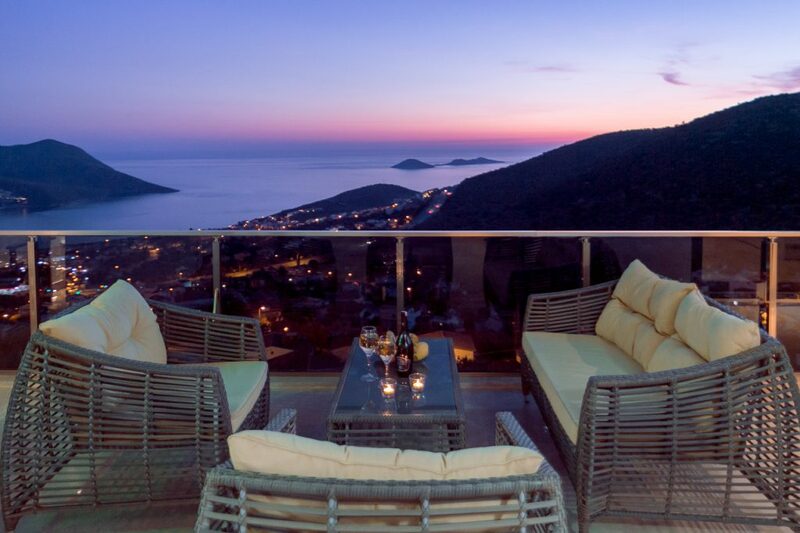 Villa Elegance – it really is all in the name. 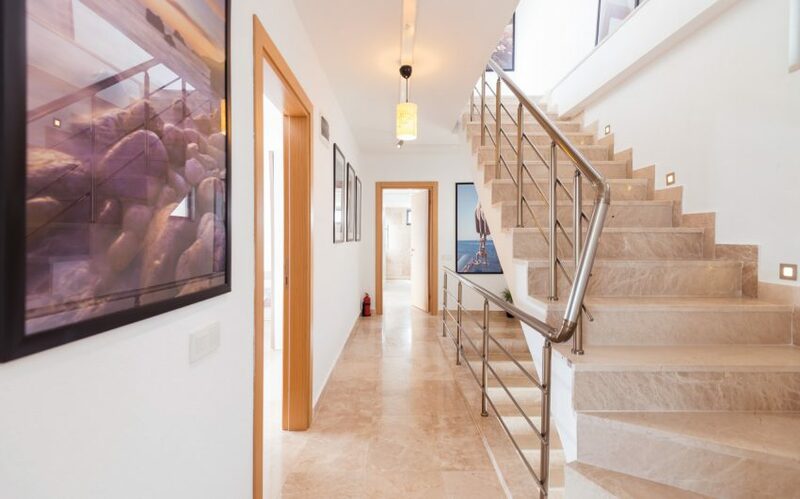 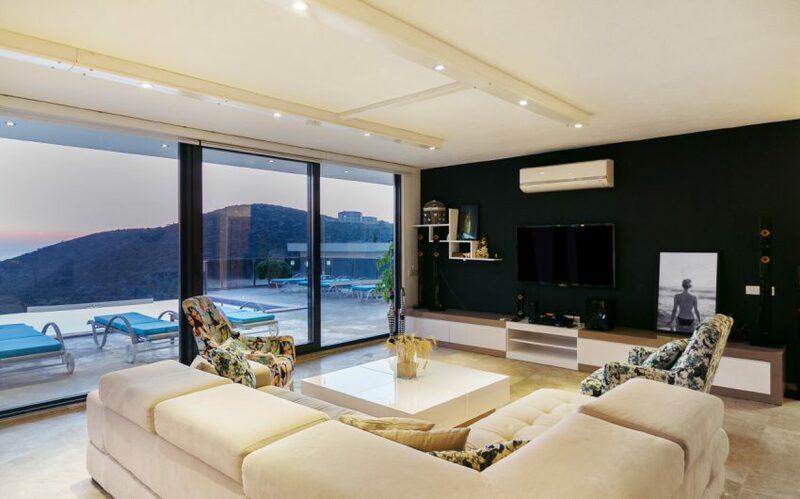 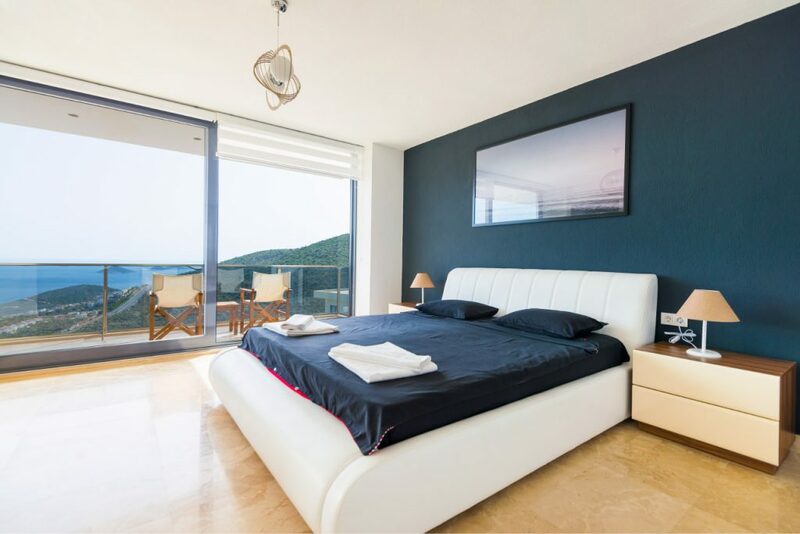 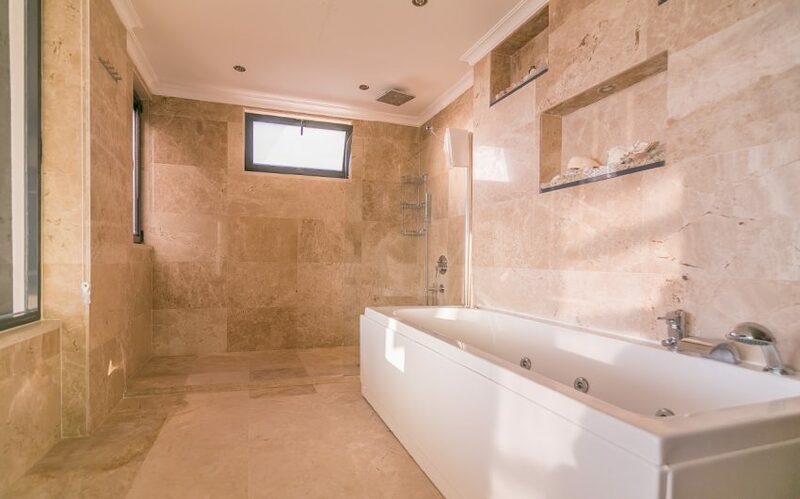 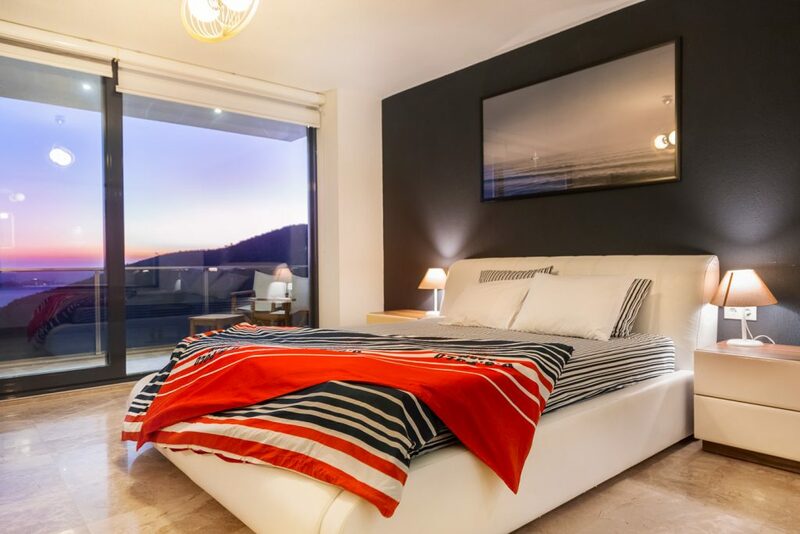 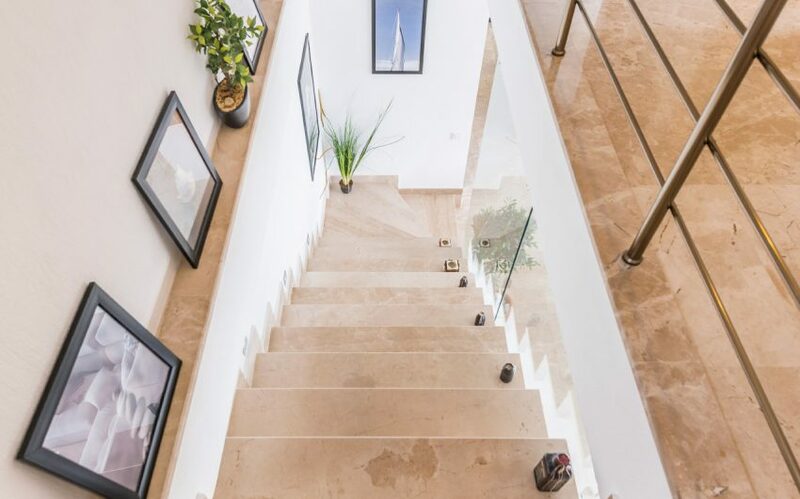 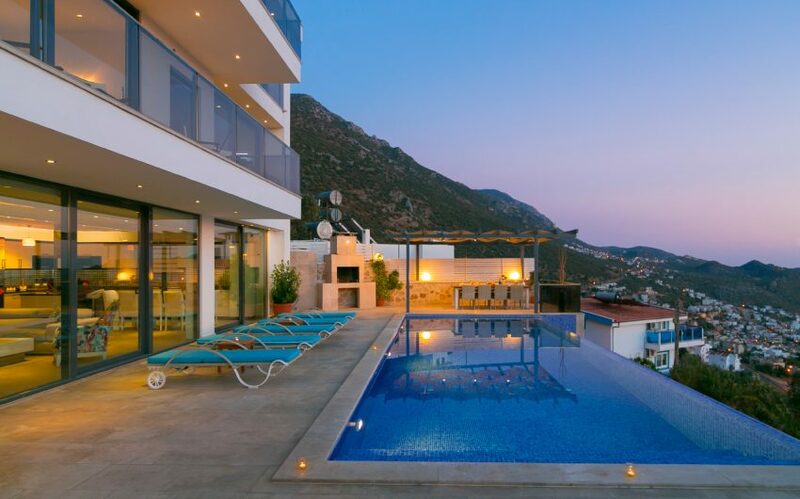 Completed in 2015, this 6 bedroom villa, which accommodates 12 guests very easily, is a masterpiece of contemporary style and understated elegance. 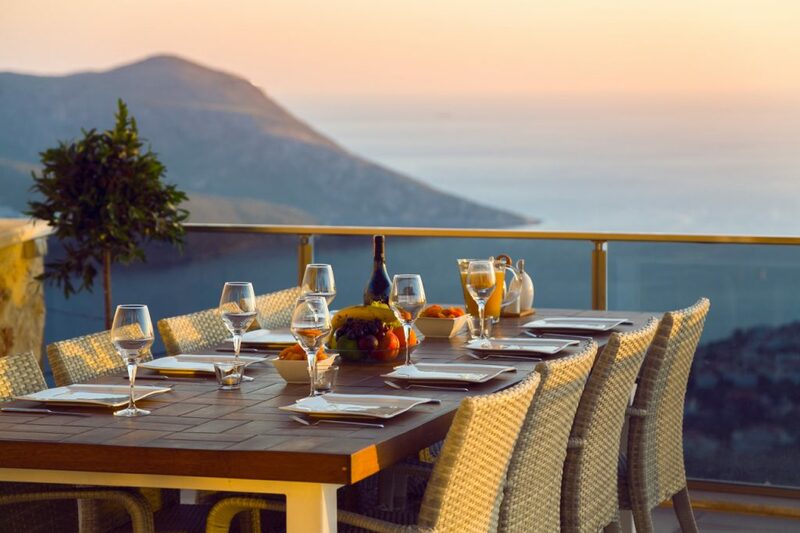 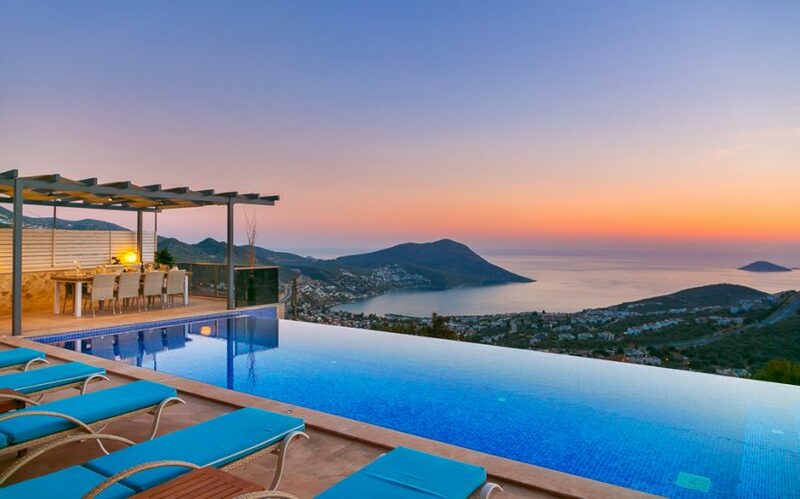 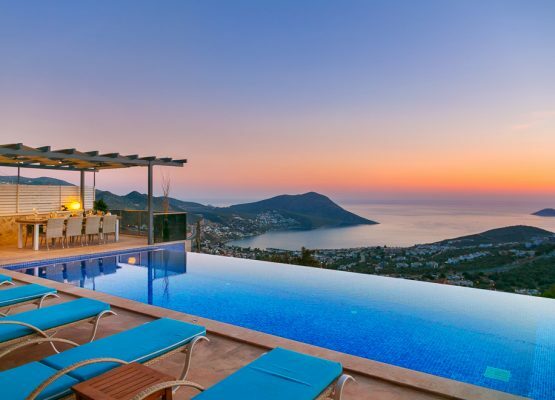 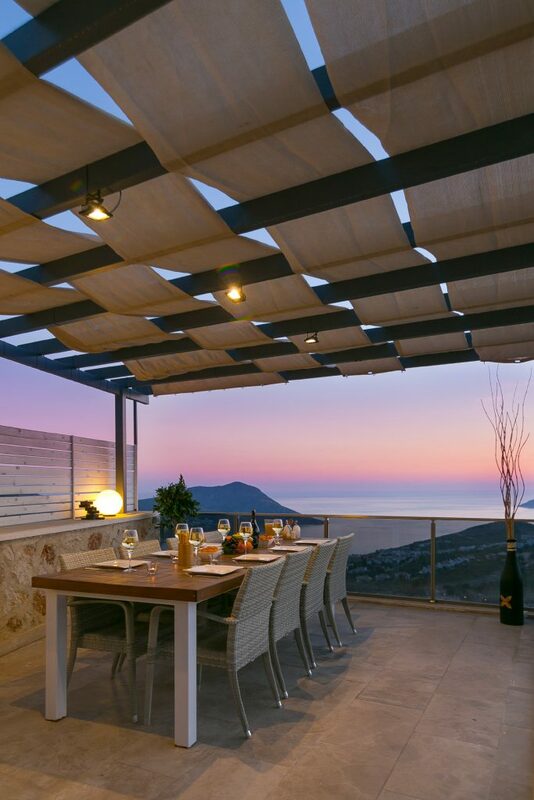 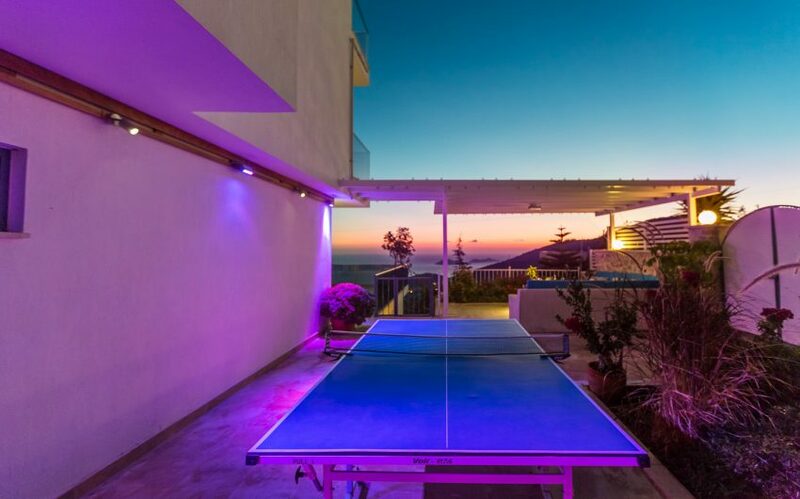 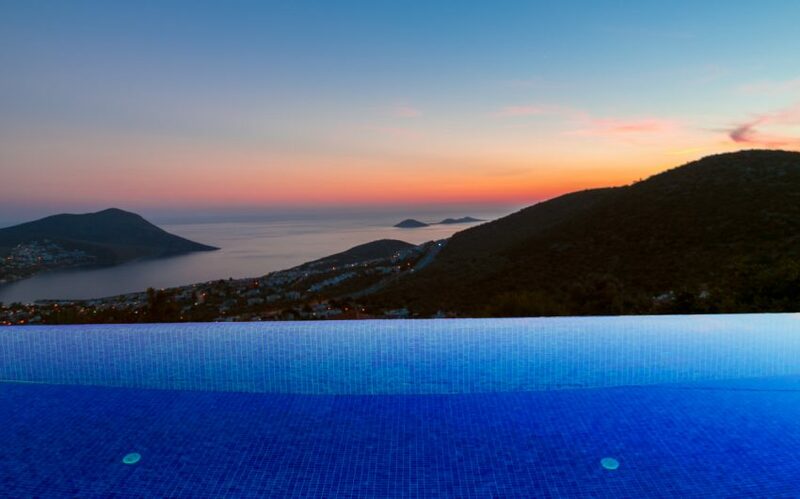 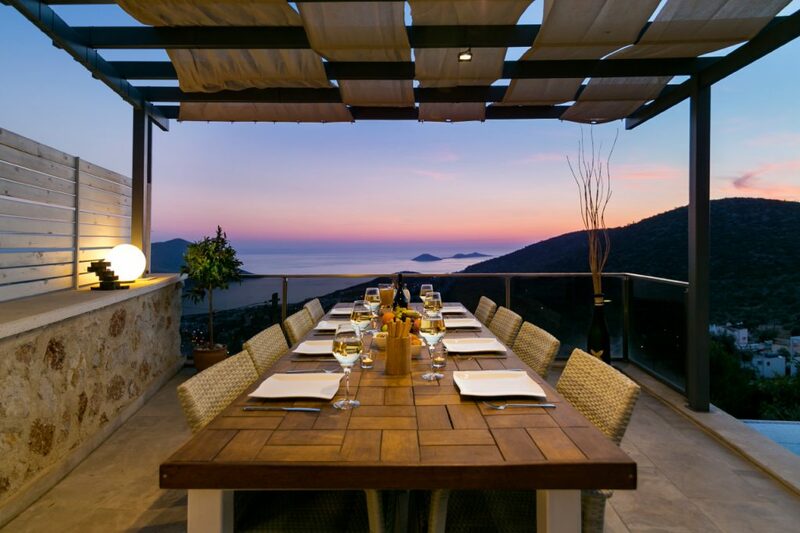 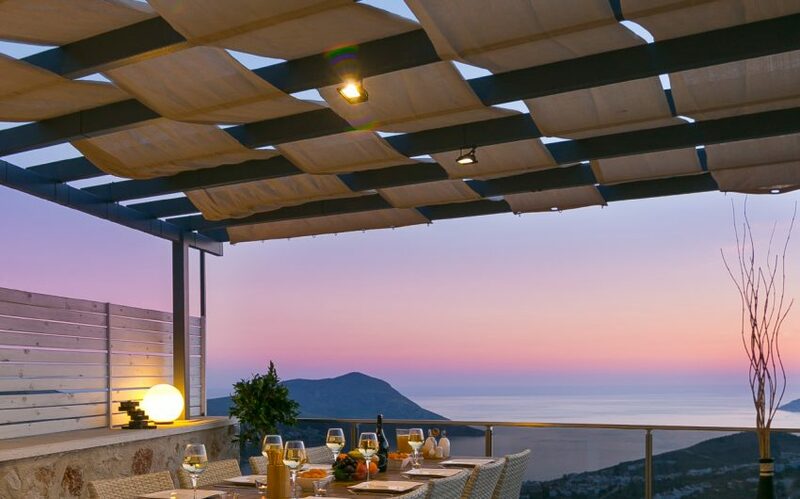 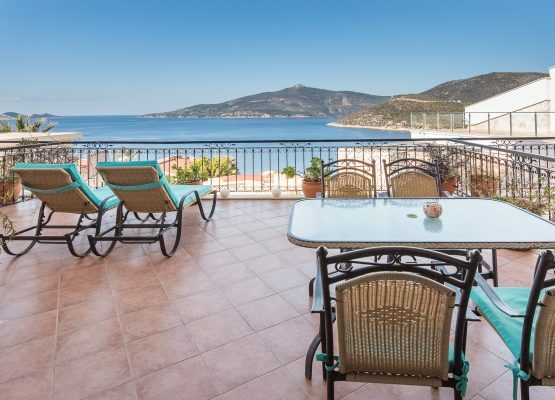 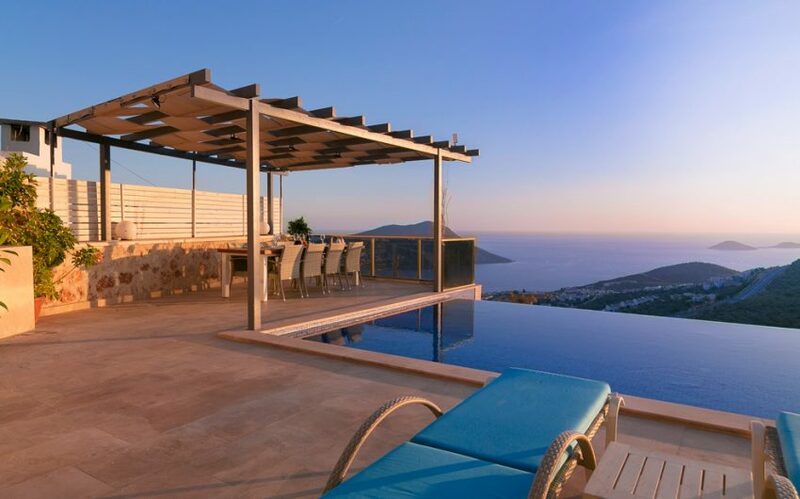 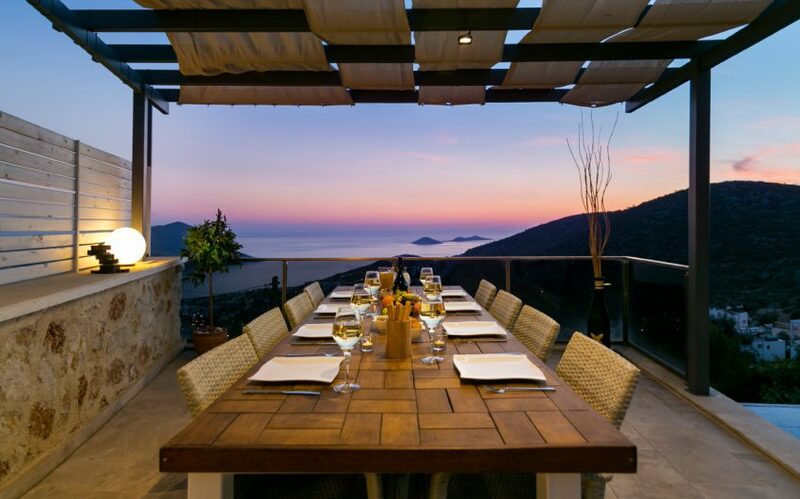 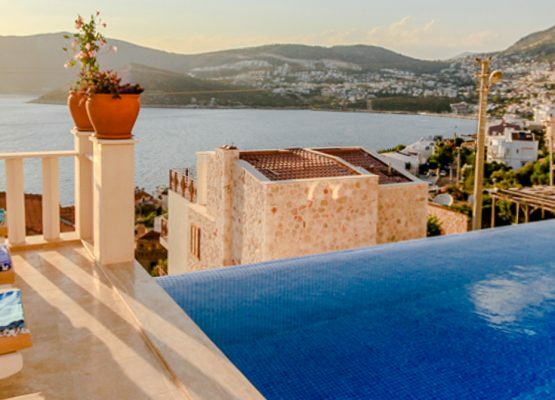 The location was chosen to reap the benefits of views that extend from the far east side of the bay round towards Kaputas, before sweeping across all of Kalkan and finally landing on the beginning of Patara which peeps round the hills at you from the west. 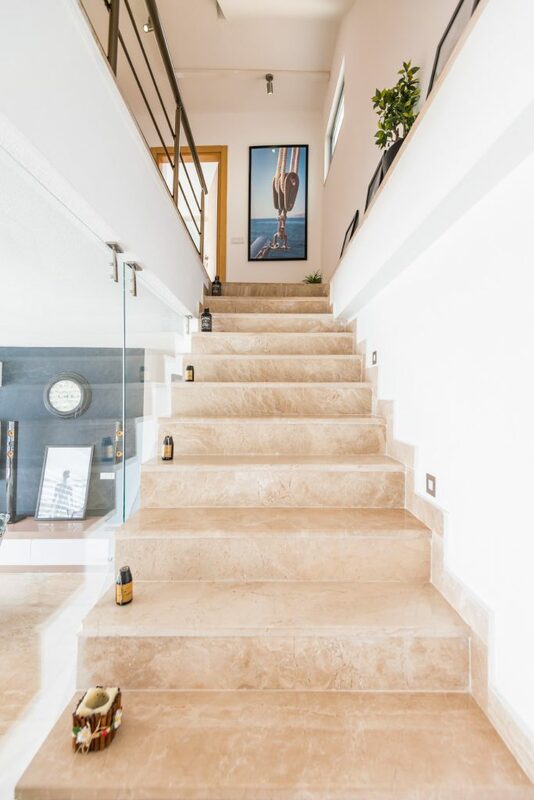 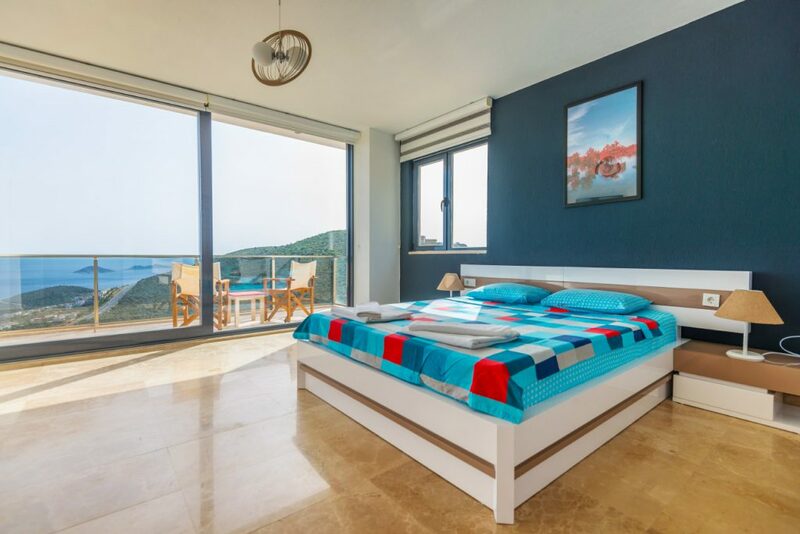 Every room in the villa enjoys this view and the floor to ceiling, wall to wall windows and doors only enhance the effect, as well as flooding the rooms with natural light. 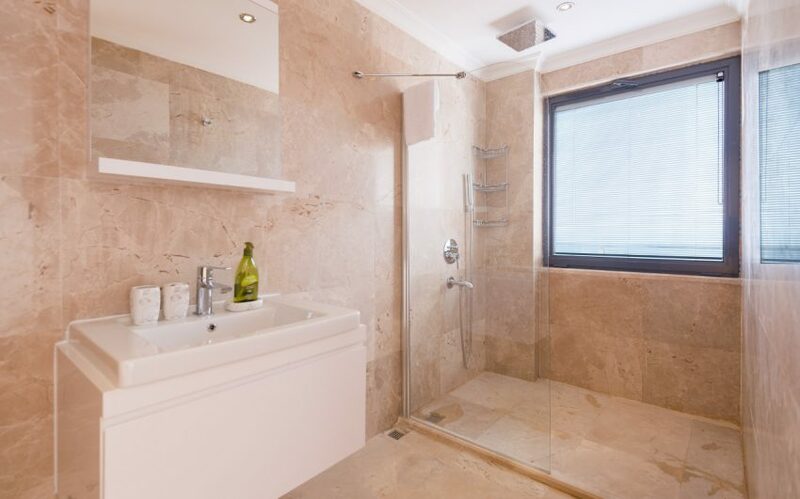 Each also has discreet blinds fitted, for privacy and for those occasions when you might want to shelter a little more from the sunlight. 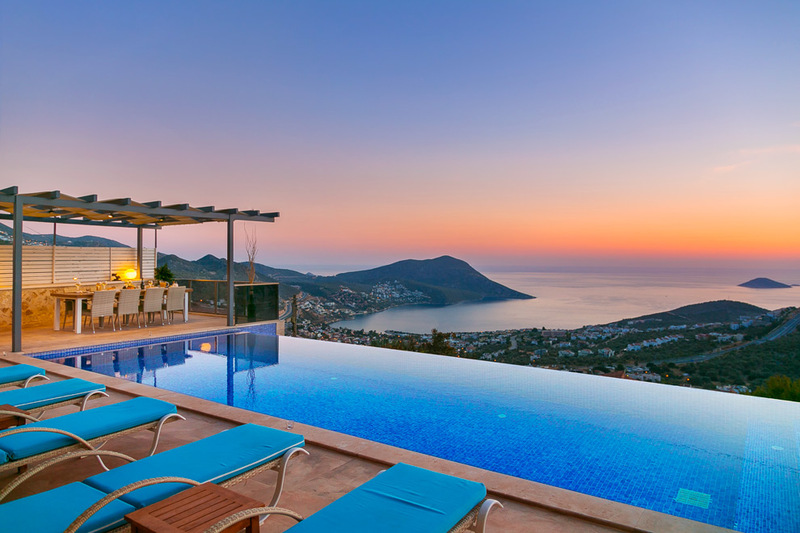 On entering Villa Elegance, you are certainly struck immediately by the ‘glass wall’ of the open plan living area, which looks out onto the infinity pool terrace and beyond to the sweeping bay views. 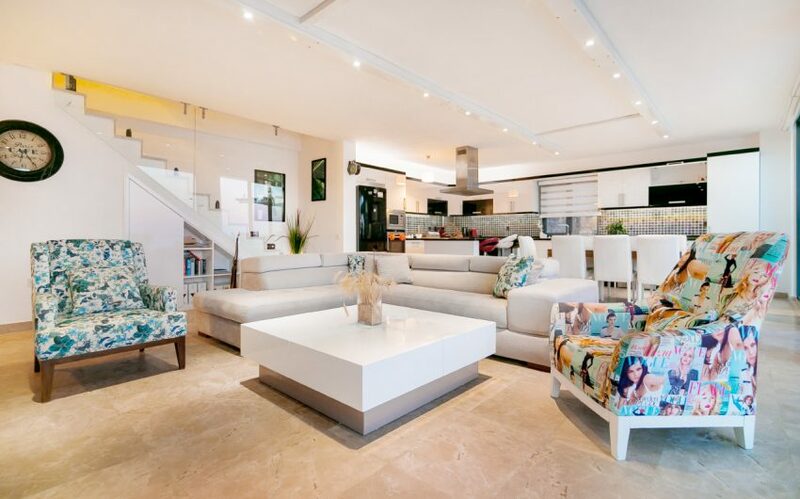 So much so, it takes a moment or two to register that you are standing in the most beautifully designed living space. 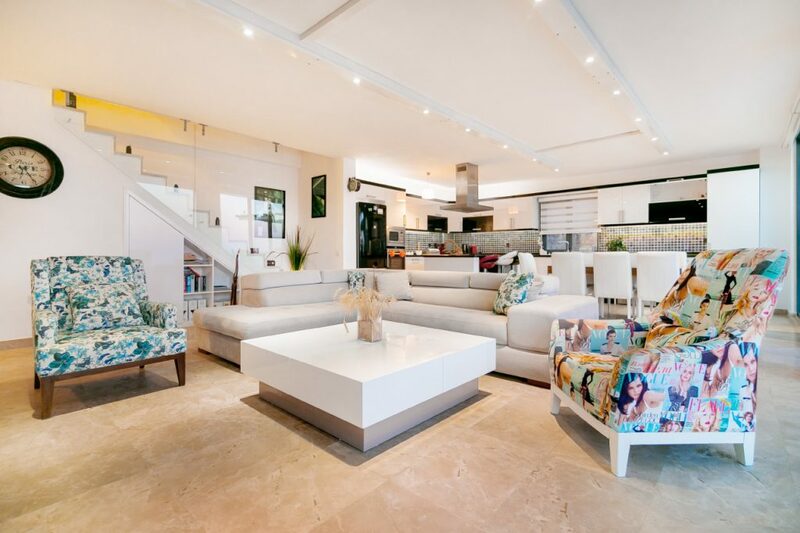 A modern yet comfortable seating area, large dining table and fully equipped kitchen all blend seamlessly into something that is incredibly pleasing on the eye. 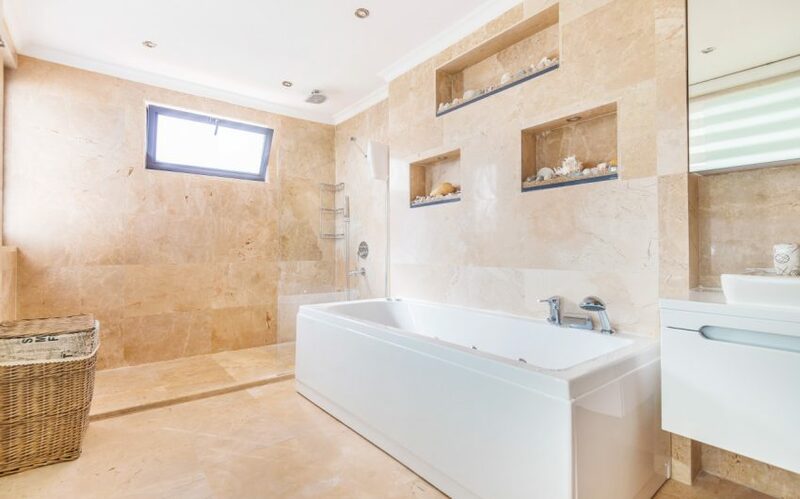 The ground floor is completed by a twin ensuite bedroom and a cloakroom. 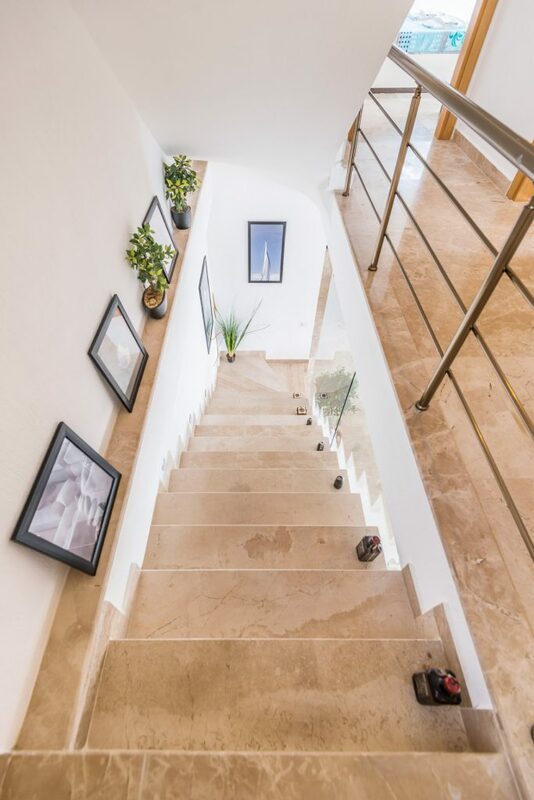 Moving up the stairs, lined with carefully chosen photographic art, the first floor has 3 generously sized bedrooms, two doubles and a twin. 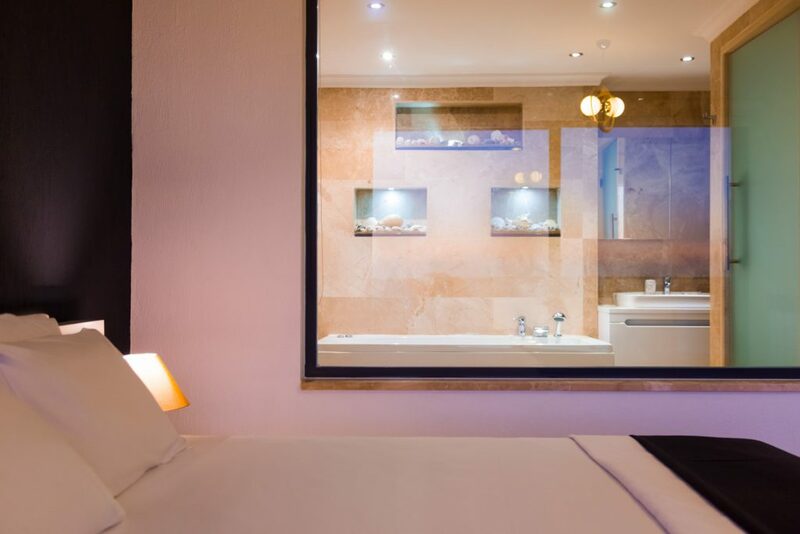 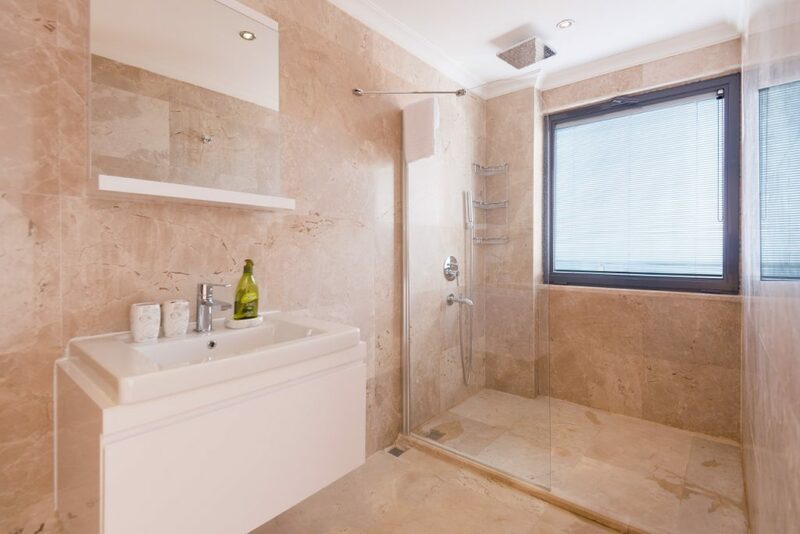 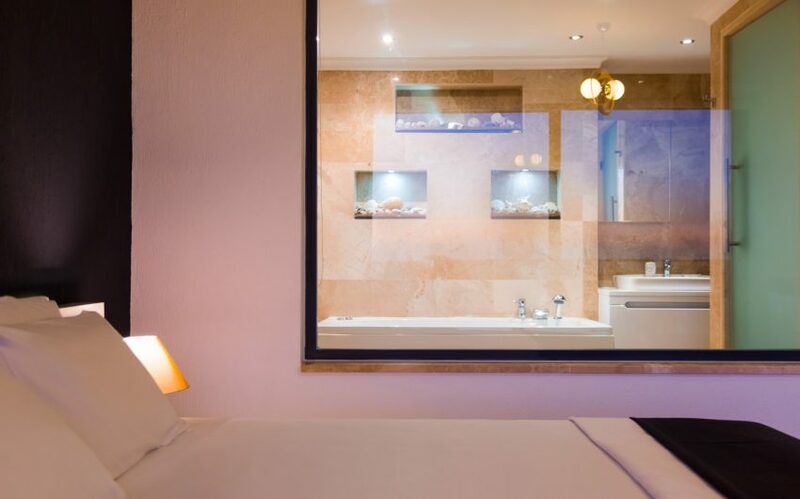 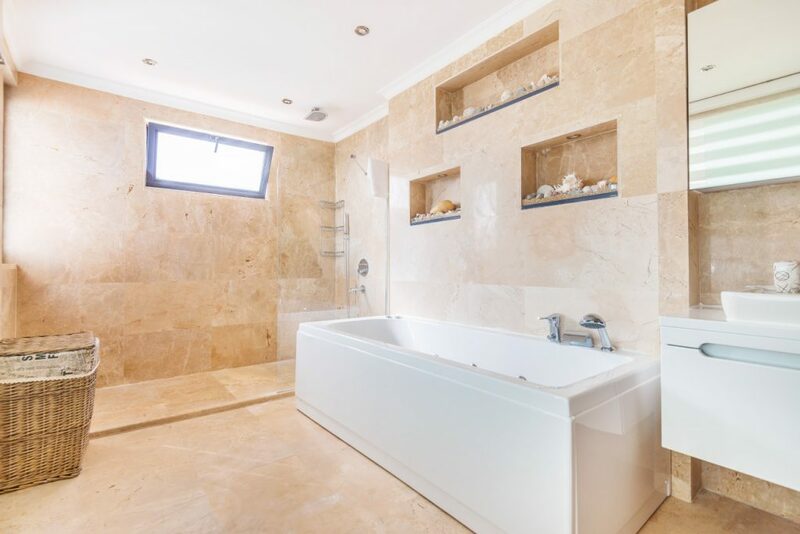 The main double room on this floor is not only ensuite, but is a bathroom ensuite, a large luxurious space complete with jacuzzi bath. 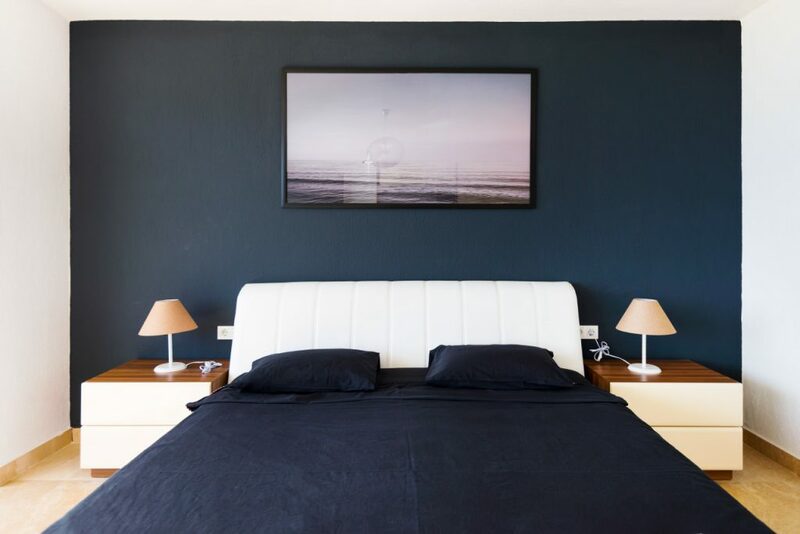 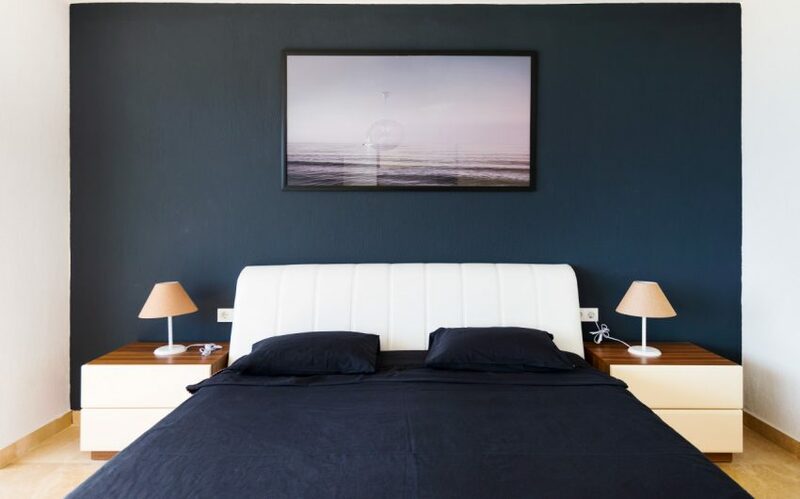 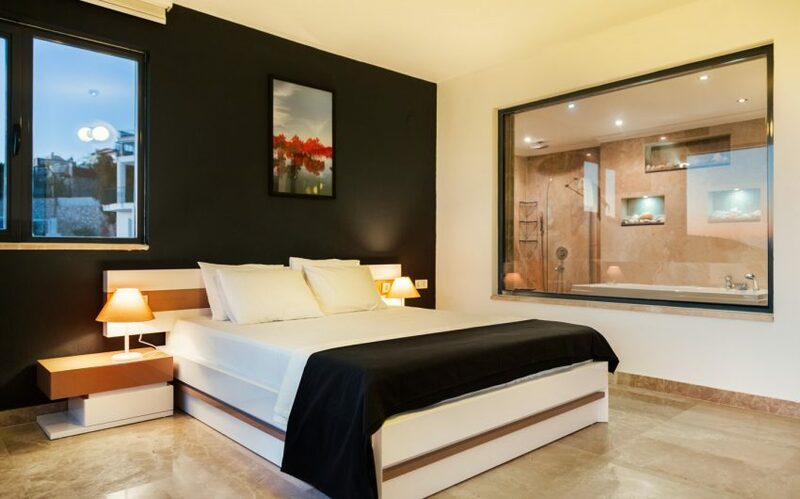 All the bedrooms are individually styled and offer plenty of storage space for clothes. 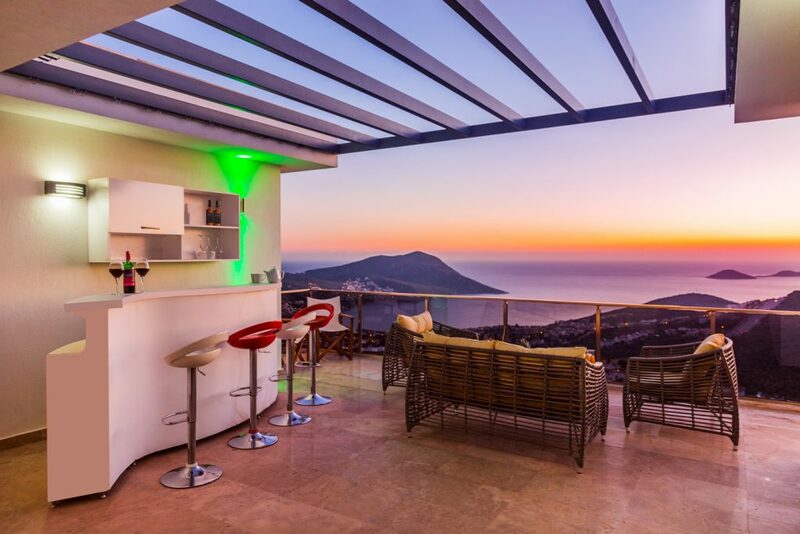 Once again we see the floor to ceiling sliding glass doors to make the most of the view and each has its own private outdoor balcony area. 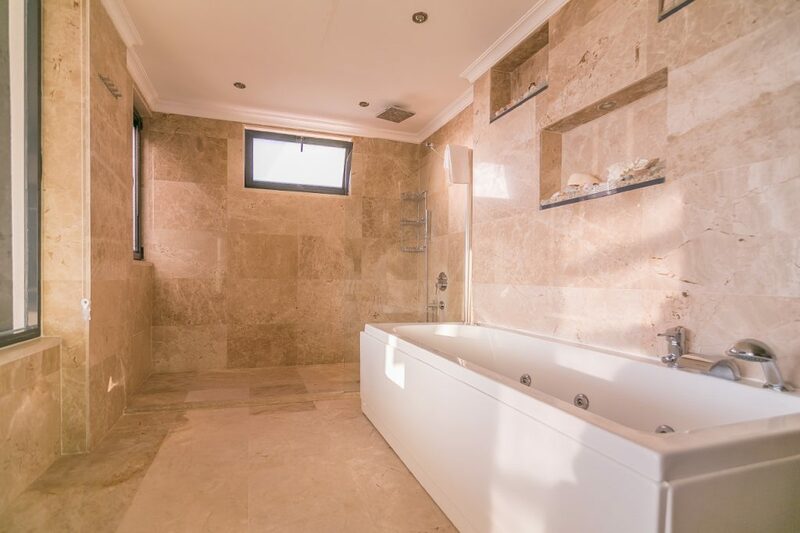 The third floor has two further bedrooms, once a again a double with large ensuite bathroom and lovely big bath, plus another good sized double with ensuite shower room. 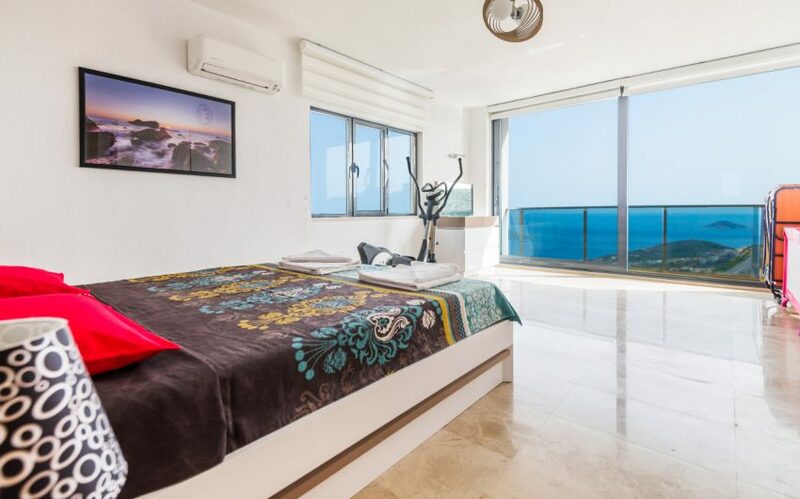 This room also has a cross trainer for guests who like to do a little working out whilst holidaying. Both rooms have the large glass doors seen throughout the villa, and lots of space. 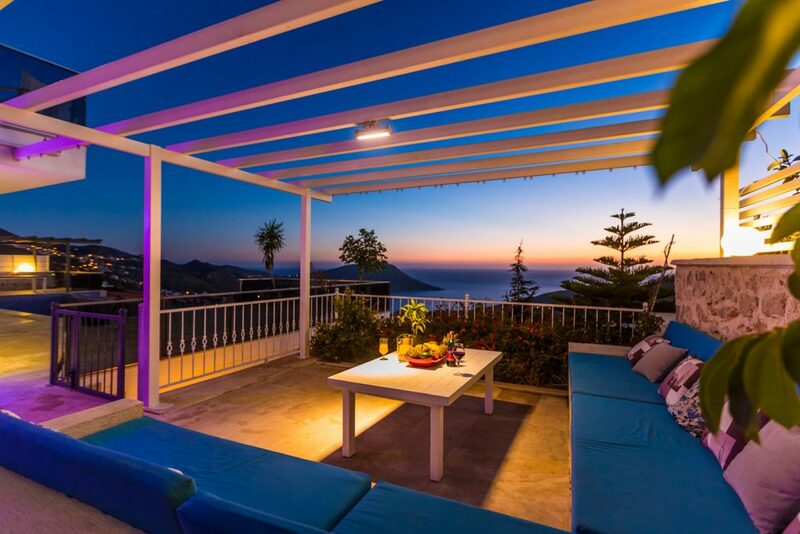 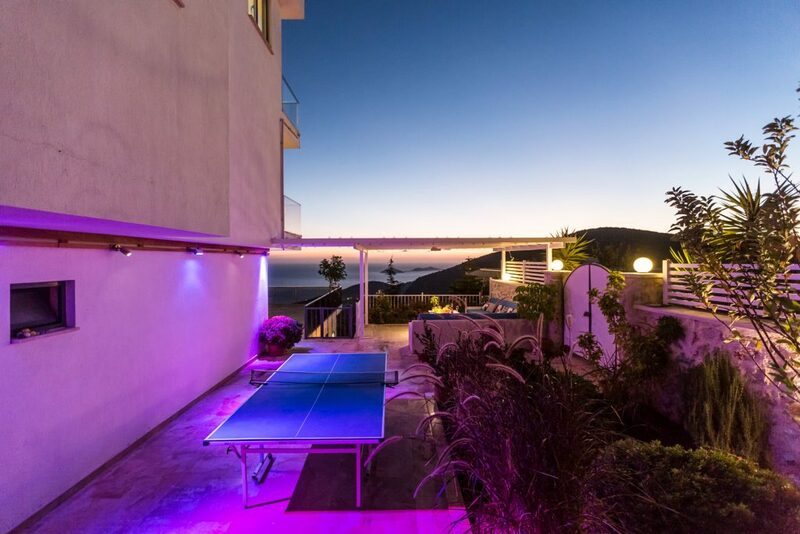 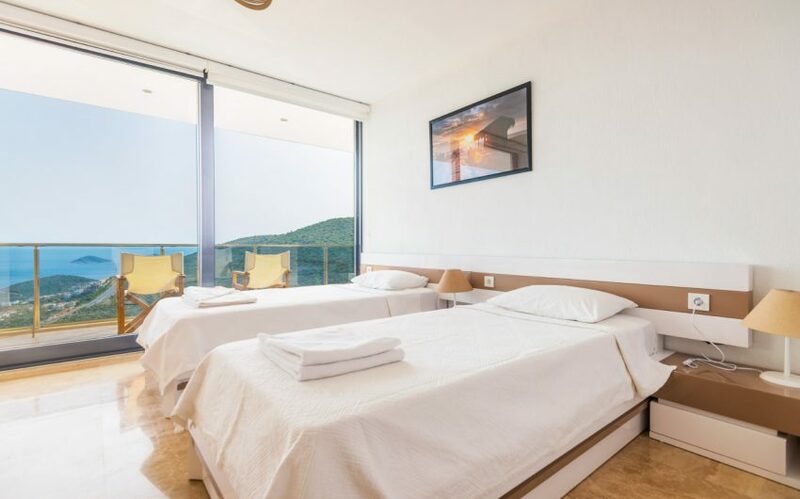 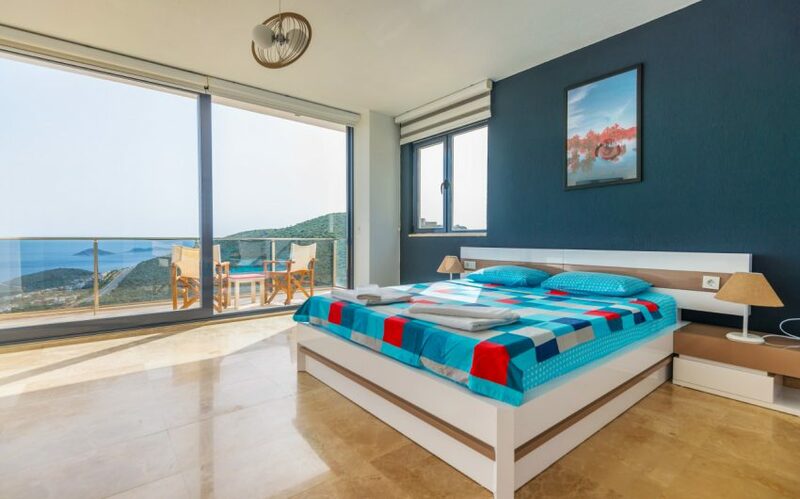 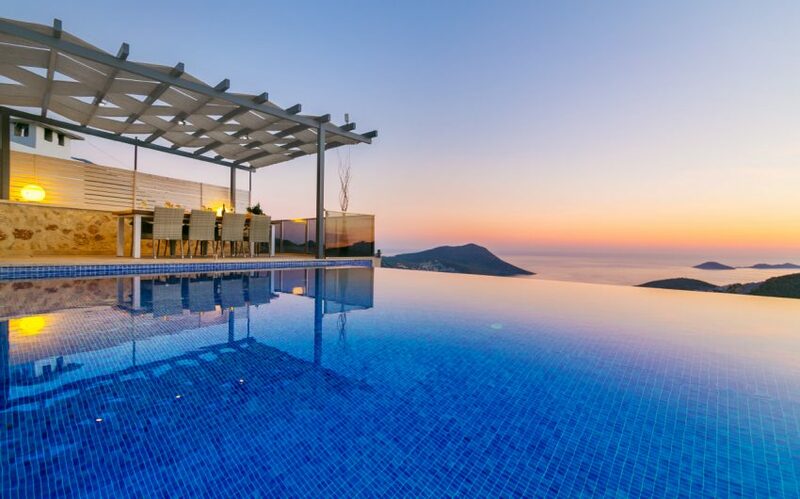 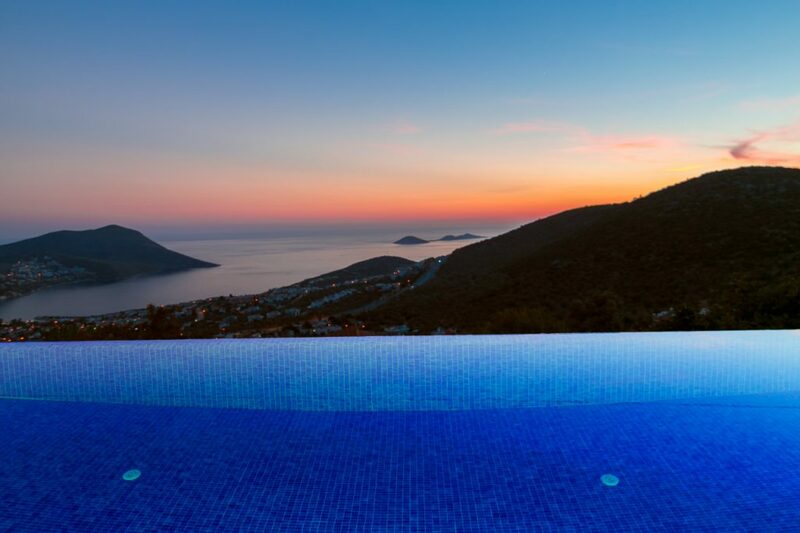 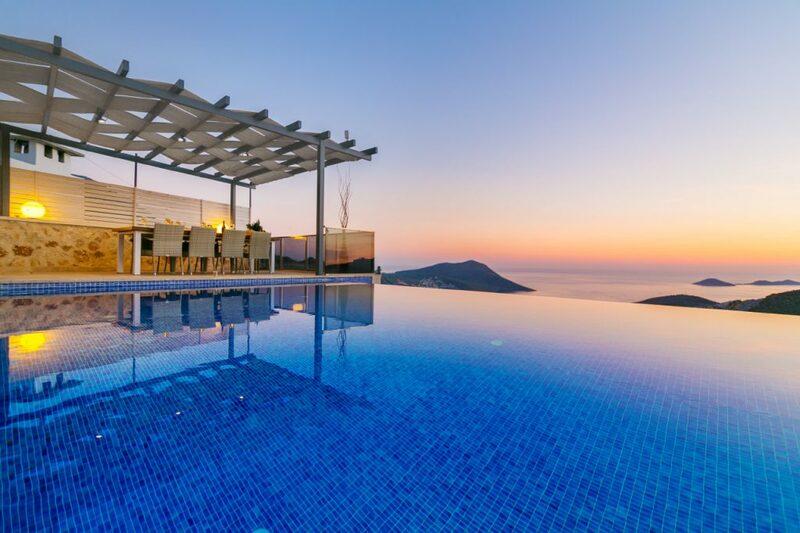 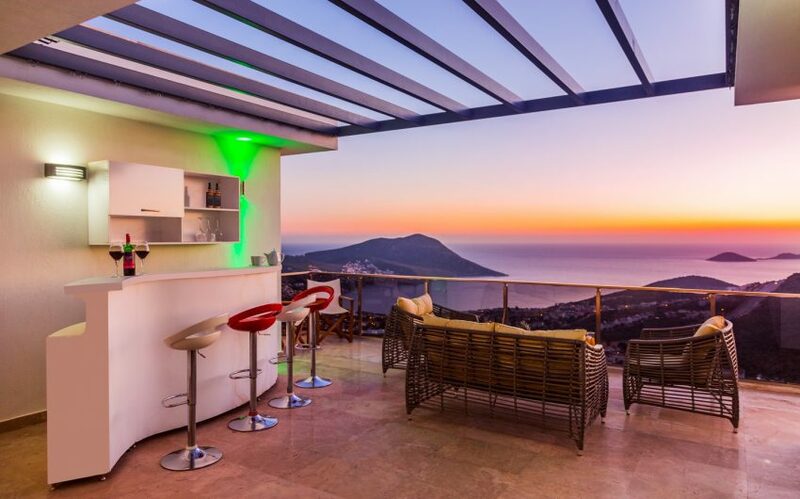 This floor also boasts access to the large upper terrace, a perfect spot to enjoy a glass of your favourite beverage from the terrace bar while watching the sunset over the most commanding view of Kalkan – which is saying something given this villa is full of stunning views. 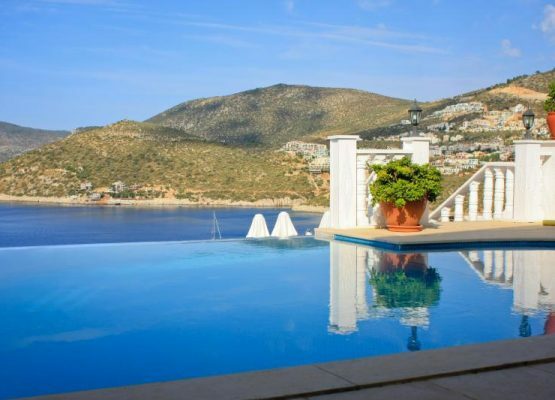 The exterior of the villa is as stylish and spacious as the interior, starting with a large infinity pool, which really does just blend into the bay at it’s edge. This is surrounded by plenty of sun loungers and parasols for all guests. 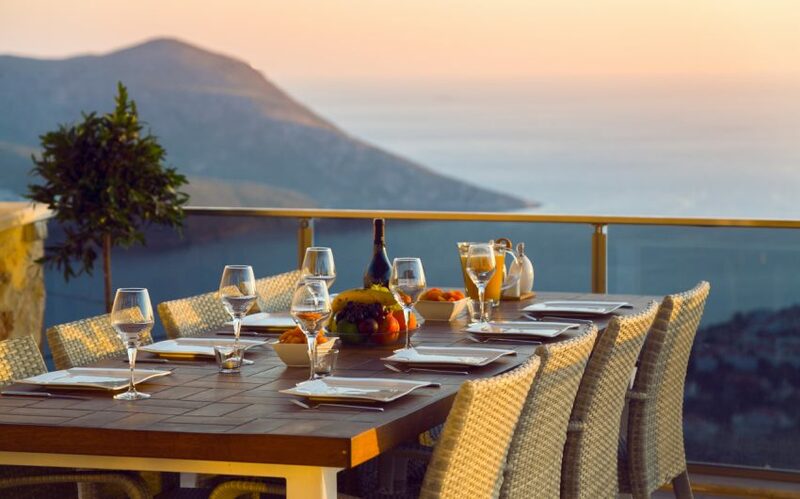 There is a sheltered dining area, a BBQ and an additional comfortable seating area with garden, plenty of options for how you want to enjoy the outdoors. 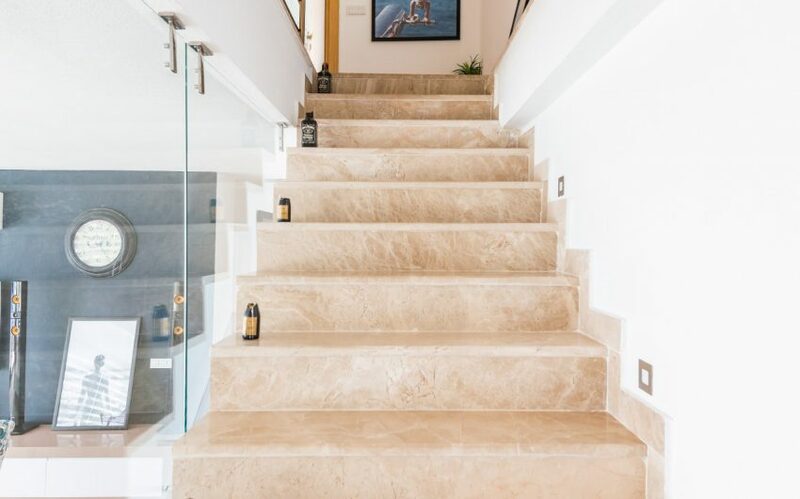 Additional features include a parking area at the main gates, which are on the same level as the main door and the ground floor bedroom, making it convenient for anyone less fond of climbing steps. 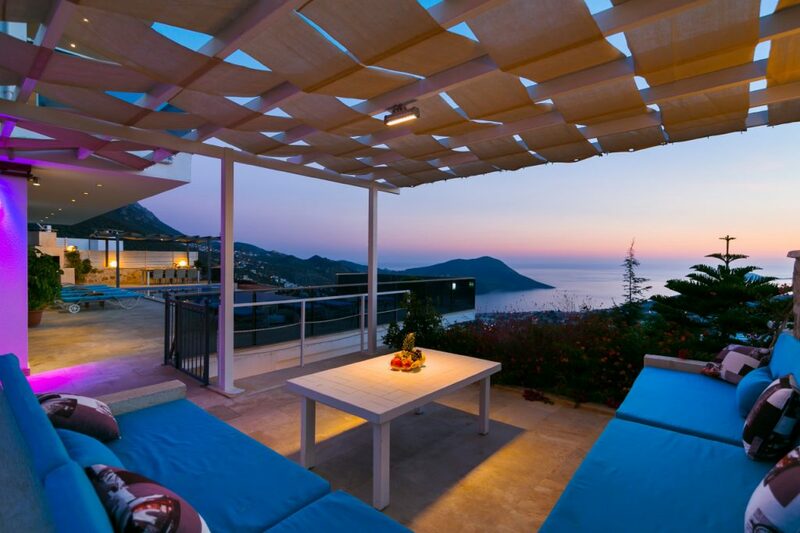 There is also a carport under the villa for guest use if required. 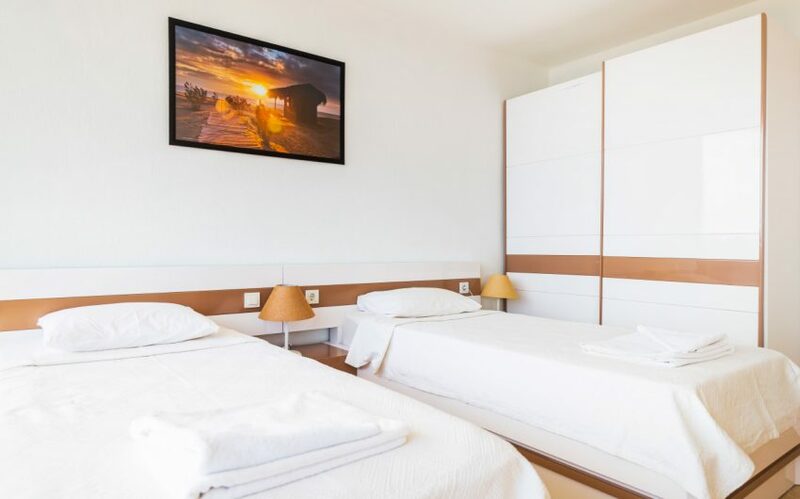 The property is air conditioned throughout, has a utility/laundry room, free Wifi coverage and for an additional charge, the pool can be heated. 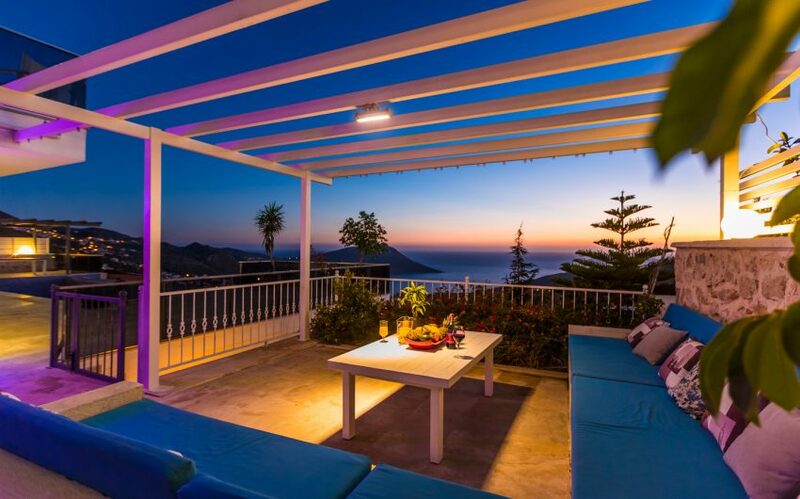 Villa Elegance is available during the winter months, please ask us for further info on pricing. 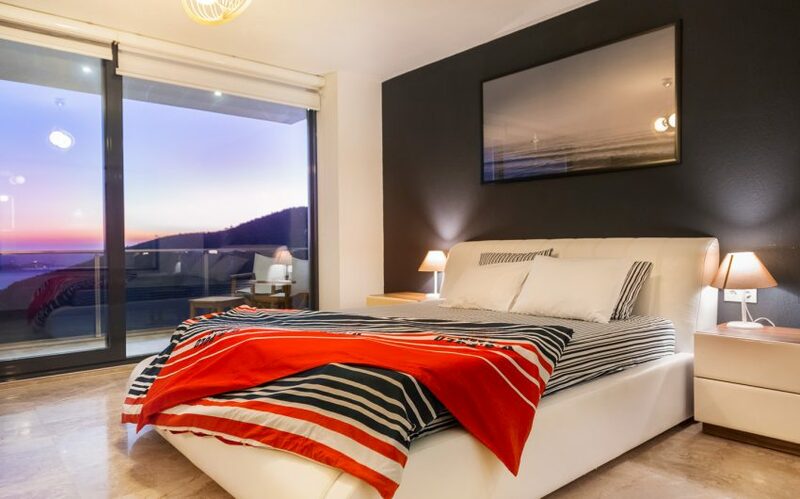 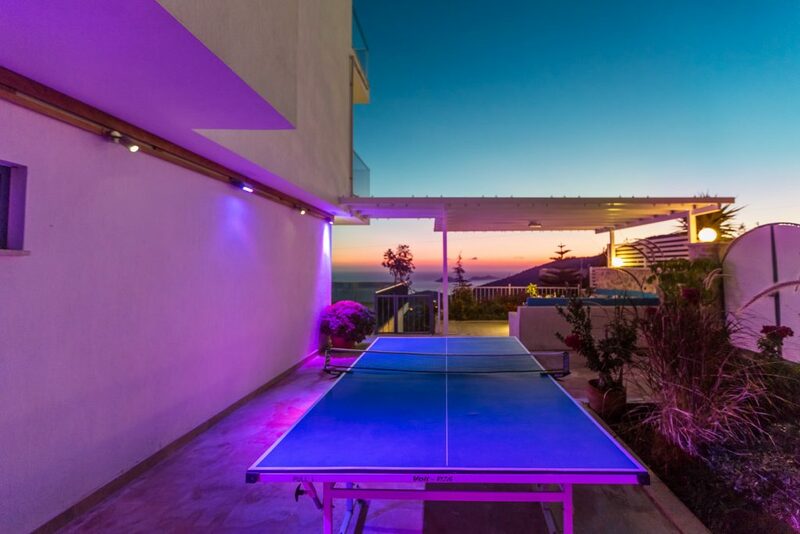 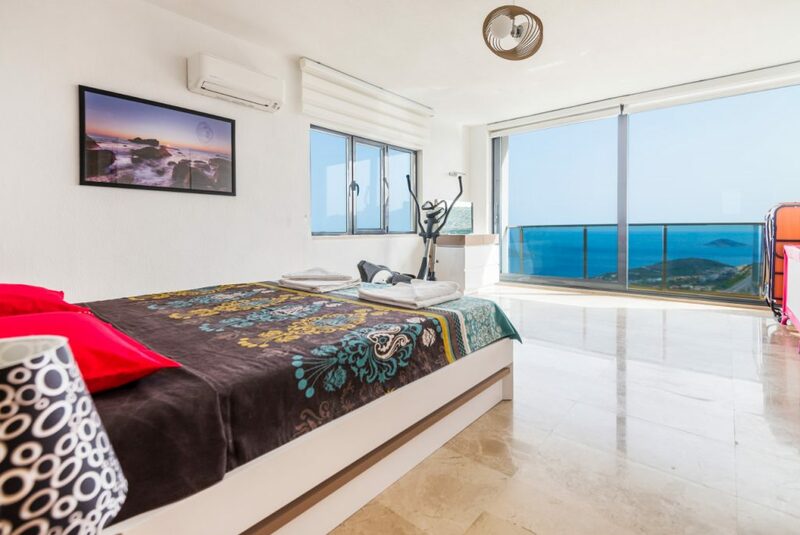 Olympos View is a beautifully appointed 2 bedroom apartment in a small, private complex and boasts a view recently described by one visitor as ‘World Class’.